Hi! 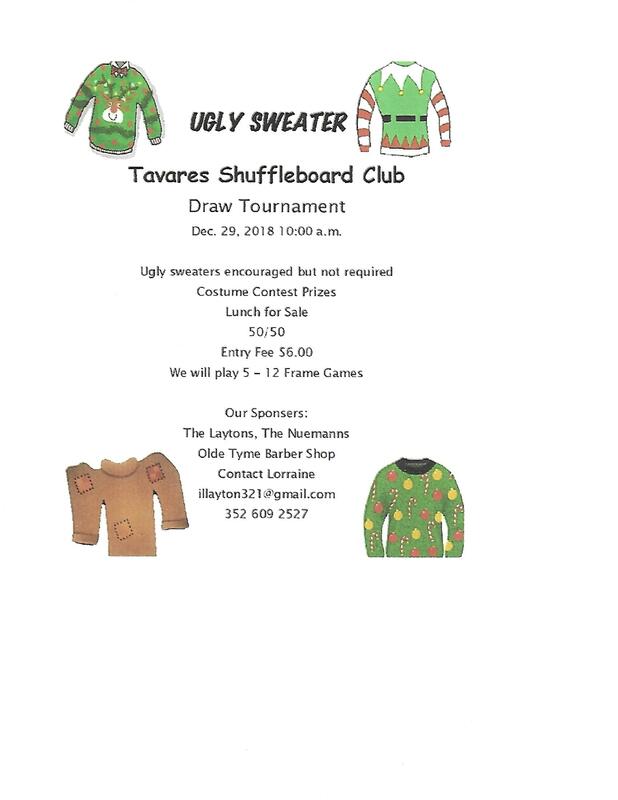 Shufflers: Attached is the Poster for the Tavares Tournament. This tournament is open to all shufflers, who are a member of a Florida Club. Please pass this info. on to anyone you think may be interested in playing. To get started on time, we ask that you arrive by 9:45 and enjoy a coffee and/or donuts with fellow shufflers. There are no points for this tournament, it is only for fun and for one day. Every player will play 5 games and there will be no waiting to play, unless, we exceed the number of players that fill our courts, 20 of them. We do have sponsors for the tournament , as well as the registration money, that will go into prize money. See you on the courts. SEE POSTER BELOW! What is the date for this tournament? No date and is it a doubles?